As with many things, finding an ant queen requires work, patience and sometimes a bit of good luck. 1. The very first step is to make sure you can identify an ant queen from a worker ant when you see one. This carpenter ant queen formed a small chamber under the loose bark of a log. 2. 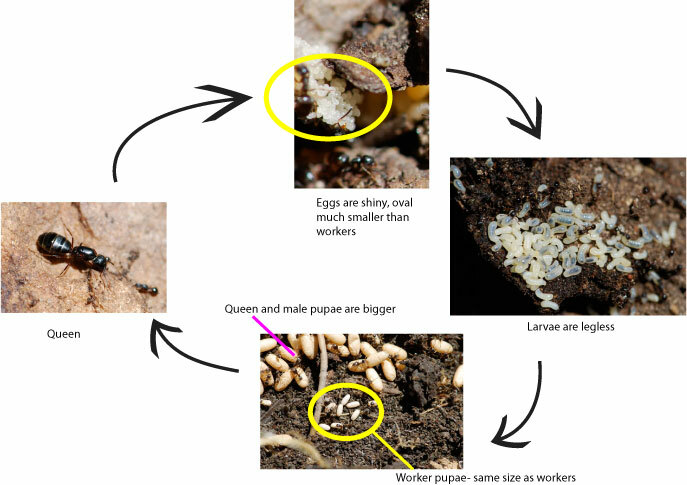 You also need to understand the colony cycle in ants. There are many variations, but in general the colony is founded by a single queen or group of queens. The queen(s) lay eggs that hatch into larvae. Once the larvae are mature, they pupate, sometimes within cocoons (See eggs versus pupae ). The first adults to emerge will be the wingless worker ants. Alex Wild calls the females with wings that have not gone on their mating or nuptial flight “princesses.” They may stay in the nest for weeks until conditions are just right. When the winged ants are flying out of the nest in order to mate and start new colonies, it can be called “swarming,” the “nuptial flight” or simply “mating flight.” Unfortunately swarming is also used to describe mass movements of ants, so it can be a confusing word. Generally the workers ants are rushing about in great numbers protecting the emerging males and princesses as they prepare to fly off. Once they have mated, the “princesses” generally pull off their wings and are ready to start new colonies. This is an optimal time to find new wingless queen ants. 3. Next, learn something about what kind of ants you might find in your area. 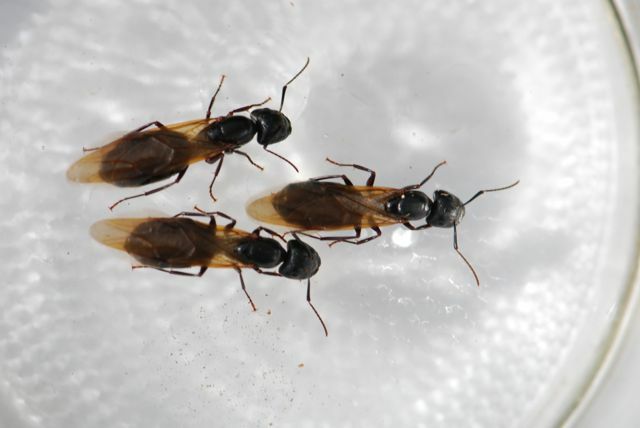 If you have one or two species in mind (I would recommend larger-sized ants that don’t sting for a first ant farm), then you can look up when queens are likely to be active in your area. How do you do find out what kinds of ants are in your area? One place to start is AntWeb, which has ants identified by region. See that tab at the top of this page that says Ant-Related Websites, Forums and Blogs? There are a number of blogs that specialize on ants in a given region. (Please let me know if you have one to add.) You can also search the ant forums by the name of your state or country for more information. You might consider joining an ant forum or social media group to learn more about the hobby, as well. 4. In general, ants tend to swarm associated with certain environmental conditions such as temperature, humidity, time of day, and precipitation. 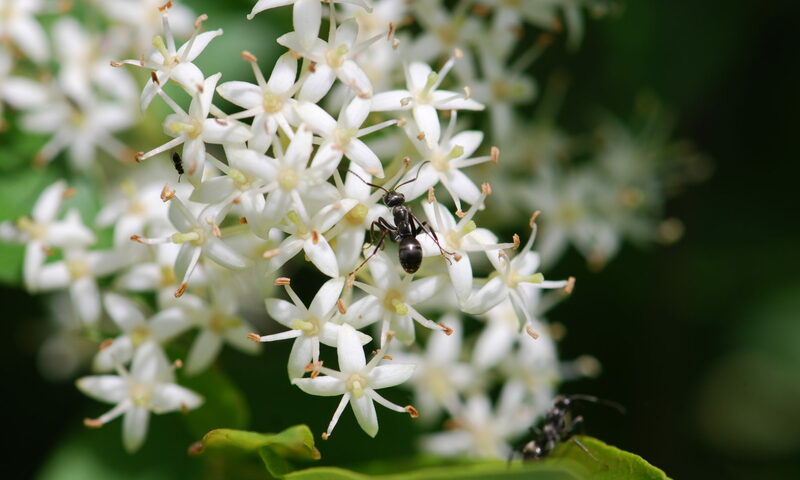 For example, in New England, you can be sure to find carpenter ant queens running on the ground the morning after the first spring thundershowers, likely in May. Here in the Southwest, harvester ants swarm after the summer rains in July called monsoons. Learn what conditions the ants you are looking for prefer and watch the weather! 5. Finally, nothing beats getting outside and searching around (just be sure you have permission to collect where you search.) Look under stones, sticks or near where lights are left on all night. I found some queens near tennis courts, which have bright lights on at night. Others have found queens that have fallen into pools. Good luck! I just got an ant farm, 20 harvester ants. No queen. I live in North America Mississippi! Can I find a queen? And will the soldier ants kill her if I set her in there? Please help! I apologize for the slow response. Most kinds of ants will not accept a queen from another source. If you have a queen, keep her by herself and let her develop her own workers. I live in MA, near a small forest. What is the best time to look for a queen? Some of the best starter queens are carpenter ants. They typically fly in the spring, starting in May. Watch the weather for the first big afternoon thunderstorm of the spring, when the afternoon is warm and humid, producing thunder clouds. Expect to see carpenter ant queens running on the ground the following day. Try carefully looking under stones or pieces of wood. The weather is the key, though. There are many different kinds of ants and they live in different places. Try to learn more about the type of ant you want to study. If you are looking for queens to start a colony, I suggest you wait until the summer. Many species of ants go on mating flights around the summer monsoon storms. I live in Vietnam HCM when do I catch a queen ant or buy one alive? I live in southern Wisconsin and I want to find a Camponotus queen. When do they take Nuptial flight here? Try to watch the weather. They often swarm (go on the mating flight) right after one of the first afternoon thundershowers in May. I live in Rhode Island, there are no recorded information of Ants here, although I know there are some. If I don’t know the species I want to catch, what do I do? Any advice? I live in central Illinois. I need to know when carpenter or sugar ants will start nuptial flights. Carpenter ants start in late April or May after the first hot, humid day turns into a late afternoon thundershower. They have probably already mostly swarmed for this year. You won’t be able to add a queen in with workers and solders if they aren’t from the same colony. They will likely attack each other. According to Antwiki you have some species of Camponotus or carpenter ants. They are good to work with because they don’t sting. I live in NY and i was wondering when i should look for queen ants as i am currently trying to start a ant farm? I’m afraid its too late in the year now. Expect the queen ants to start swarming when it warms up in the spring, typically late April to May. Hi, I was wondering what is the best time of Day to look for the species Camponotus because I live in Colorado US and its the right time of the year but again I don’t know the correct time of day. 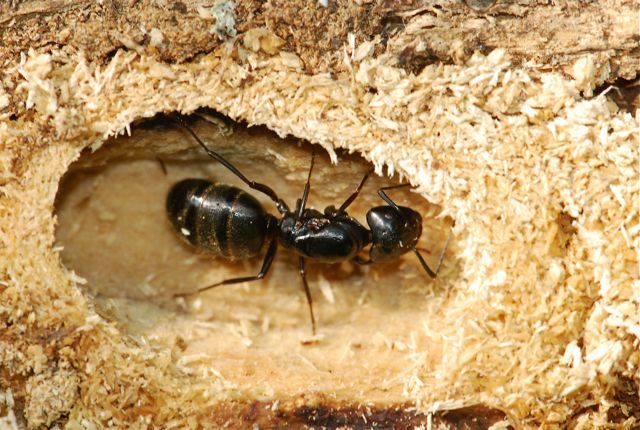 Typically carpenter ants swarm right after a thundershower, but you can also find the newly mated queens crawling on the ground the next morning after their flight. It really depends on what kind of ant you want to find. Different species of ants swarm at different times of the year. I lived in the Philippines. When can i catch any queen ants? I suspect you’re taking about eastern North America? I live in Mauritius, a tropical island. I just want to know when are nuptial flights in tropical seasons.